Some time ago I bought an infrared LED flood lamp. As shown below, this thing has 140 infrared LEDs. 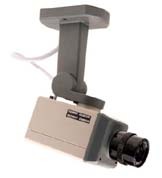 It is powered by a 24v DC supply and was originally designed as a nighttime security camera illuminator. 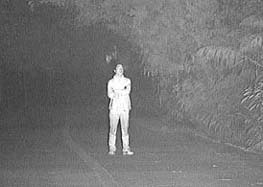 Black and white security cameras are most sensitive to infrared light, which is invisible to human eyes. I often wondered if this kind of light source could be used to make a long range motion sensor. As outlined in the block diagram below, here is how it would work. 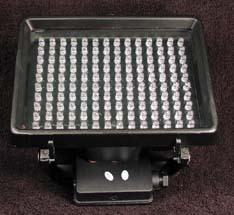 The large LED array would be modulated (turned on and off) at a medium frequency, such as 40KHz. A large area light sensor (perhaps 1cm x 1cm) positioned off to the side of this illuminator would collect some of the light reflected from objects, going out to perhaps 100 feet away. The light detector would be connected to first a current to voltage converter then to a narrow bandpass filter, which would concentrate only on the 40KHz signal. Using this technique, the circuit would be immune to ambient light variations. The Amplitude of the received 40KHz signal would be converted to a DC voltage, using a rectifier circuit. The changes in that voltage would then be Amplified. Finally, the Amplitude change signal would be connected to a voltage comparator, whose reference voltage could be made adjustable. Any object, such as a vehicle or a human, moving into the field of view would change the Amplitude of the received signal. To enhance the Amplitude changes, bicycle reflectors and reflective strips could be scattered about in front of the illuminator. These would produce large changes in the reflected light signal, as the object moved in front of the reflectors. The experiment would be to see if this concept could be made to work. I’m sure this concept would work indoors and but I think it would only work outdoors in areas which do not have a lot of vegetation. I would think that high winds would certainly cause problems as trees and bushes moved in the wind. But, when pointing the system at hard surfaces, like a parking lot or a loading dock, the method should work. 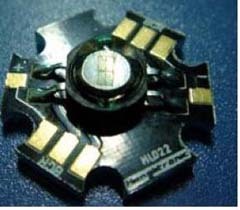 To reach out and detect motion out to 100 feet or more, a spherical lens could be positioned in front of the bare silicon photodiode. As shown below, a 2 inch diameter lens would gather about 20 times more light than a bare photodiode. Based on the inverse square law, that should increase the range by a factor or 4X. 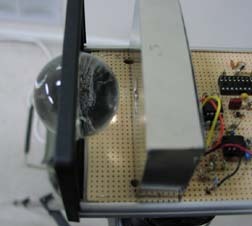 The infrared motions sensing system could be tied into a security camera. When the motion sensor detected motion, the camera would be switched on, capturing images or even movies of the object. 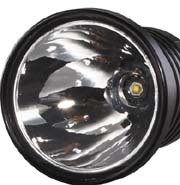 Another thought is to use some of the latest 5 watt infrared power LEDs. Just one of these devices would replace the whole array of 140 smaller LEDs. Also, the light pattern could be shaped for a wide area flood or a narrow spot, using some plastic flashlight type reflectors.